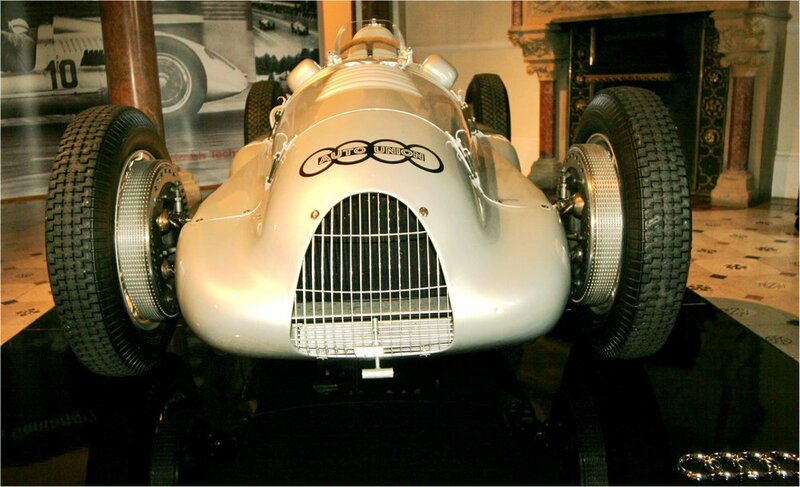 I always wanted an Auto Union (above). My favourite Dinky Toy was an Auto Union record car. I can still feel its fins and spats with a five-year-old’s fingers. Dinky only made it from 1936 to 1940. This is a later one rebuilt and shown at Geneva in 2009. It was in my teens, as what Laurence Pomeroy* liked to call a student of motor racing, that I realised how important 1930s Auto Unions had been. Deeply into polar moments of inertia Pom was sure 6 litre V16s with 60 per cent of their weight aft were difficult to handle. The tail could move through a considerable angle before the driver realised breakaway point had been reached. He would then find it hard to counteract. Pom was Gospel. Only Bernd Rosemeyer, he said, really mastered engines aft. Aintree 1955 British Grand Prix. Brabham retired with a bent vale on his Bristol engine that was 100 horse power down on the supercharged desmodromic fuel-injected Mercedes-Benz W196, which overtook him every five laps. Yet at my first grand prix I watched Jack Brabham prove that a centre-seat Cooper sports car with an engine ahead of the rear wheels was just about able to keep up. Scorning Pom’s view that oversteer was problematical, the former Australian dirt track driver led a revolution that vindicated Ferdinand Porsche’s* principles for Types A, B and C Auto Unions that were so challenging to Mercedes-Benz in that Heroic Age of motor racing. Brabham took mid-engined Coopers to World Championships in 1959 and 1960. 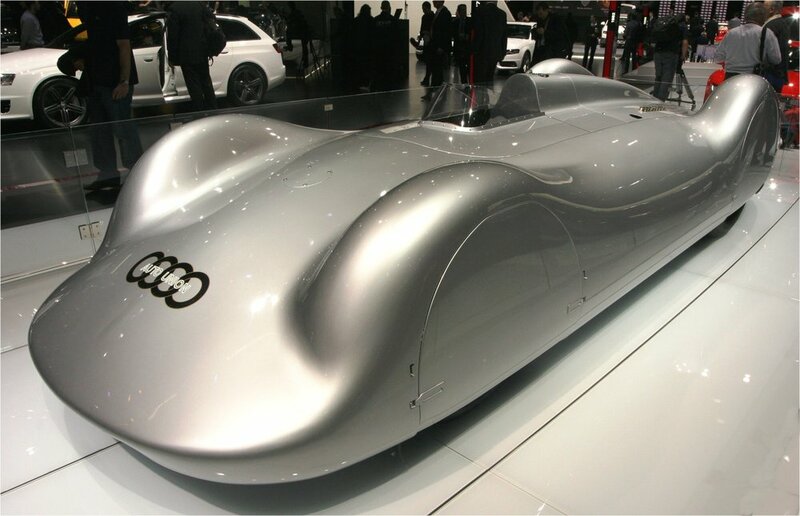 So I am at last getting my Auto Union. It’s an Audi now, one of the four interlocking rings that joined up in 1932, amalgamating the entire motor industry of Saxony. DKW, Horch, Wanderer and Audi had to weather financial storms following the Great Depression and face down intervention from the Third Reich. Amid the ruins of 1945 with Saxony, Leipzig and Dresden at the wrong end of Germany, only DKW could be revived. The four rings survived as Audis. We are trading in our Honda Accord Tourer for an A3 Sportback from Lincoln Audi. We had an Audi 100 in 1992 in my Sunday Times days which, I wrote, “…brought Volkswagen into contention with BMW and Mercedes-Benz. Three million of them have been made since 1968. Following Volkswagen's takeover in 1964 it was selected as the standard-bearer, ‘because Audi was the most technically advanced of the four partners.’” A bit like Rover surviving as best brand after the British Leyland debacle. The third generation 100 of 1985 had been an aerodynamic benchmark, its galvanised body set new standards against rust. My fourth-generation one, which I drove for 13,000 miles, showed astonishing consistency. It was a 2.8 litre V6 with a fuel consumption that never fell below 23.1 nor rose above 23.7mpg, averaging at 23.3. Serene on the motorway, the optional cruise control (£277) was essential for keeping within the law. It had air conditioning (£1,717) and a trip computer (not a sat-nav £180. The car was so exemplary that it was almost a relief when something went wrong. The central locking refused to centrally lock. I complained. Alas the spares computer at Milton Keynes was having an off day and neither new batteries for the key fob or a replacement for the asthmatic horn arrived. Vorsprung durch technik was all very well, I thought, when the technik was working so I had to go round locking doors. I thought the styling of the big silver car “ungarnished”. Rivals were getting more graceful in 1992 but it was a distinguished car. At £23,688, including £1,070 for the automatic transmission, it was firmly what we called then upper-executive. And I found it reassuring to know that it had been masterminded by a genius, Dr Ferdinand Piëch, grandson of Ferdinand Porsche. He soon became chief executive of Volkswagen which his grandfather virtually founded. My earlier Audi 100 on right. 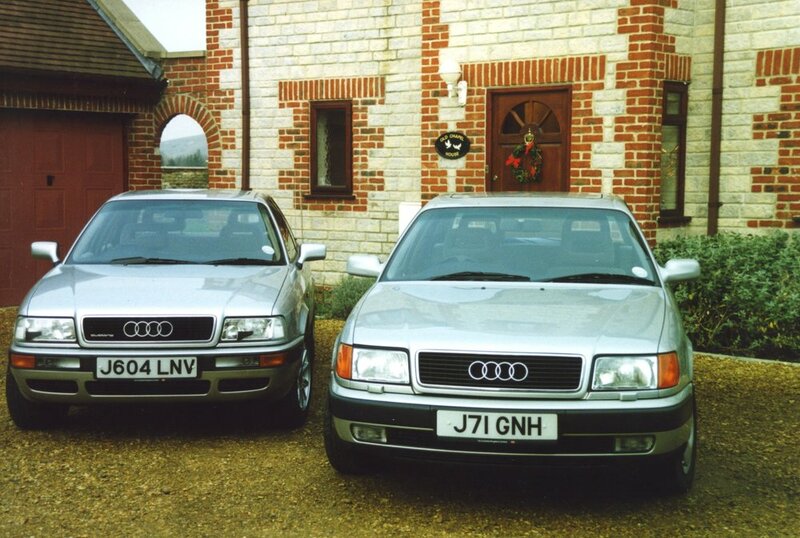 I was doing a comparative road test with a nimbler Audi 80 Quattro that had the same 2.8 V6.